This story was updated at 9 p.m. ET. A skydiver is making progress with plans to leap from near the edge of spacein a dive that would break world records and the sound barrier. Austrian daredevil FelixBaumgartner is a step closer to attempting the feat after a series ofrecent high-altitude test jumps. He plans to make his ambitious jump attemptlater this year. Starting in the stratosphere at 120,000 feet above the ground, Baumgartnerwill leap from a capsule suspended by a helium balloon near the boundary ofspace. 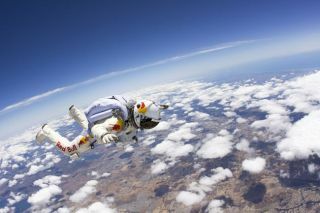 Sponsored by the energy drink company Red Bull, Baumgartner's mission ?called RedBull Stratos ? seeks to extend the "safety zone" of humanatmospheric bailout last set in 1960 by diver Joe Kittinger. This limit definesthe uppermost altitude a human being can safely jump from. A team of aeronautics experts recently led Baumgartner through a week oftesting meant to illuminate any possible weaknesses in his equipment and tofamiliarize him with the skills needed to navigate the conditions expected toassail him as soon as he opens his vessel door. Only a few feet above ground in a capsule dangling from a crane on SageCheshire Aerospace test grounds in California, Baumgartner practiced exitingand stepping off his hot-air balloon. Even a slight stumble during this stepcould cause dangerous alterations in his in-flight position only moments later,as well as reduce his chances of actually breaking the sound barrier. "The team anticipated that the capsule would tip forward when Felix movedhis approximately 270-pound self from the seated center position of the capsuleto the step-off platform on the edge of the capsule," Red Bull StratosAerial Strategist and Skydiving Consultant Luke Aikins told SPACE.com. "What the exercise demonstrated was that the capsule moved only about afoot, which tells us that we don't have to worry about the capsule swingingback violently when Felix steps off." Baumgartner proceeded to practice his step-off technique from higher up bydoing bungee jumps while wearing a pressurized spacesuit and helmet. At 200feet above ground in an abandoned fairground, the setting was a far cry from a high-altitudejump, but mimicked the sensation of trying to achieve the necessary forwardrotation, said mission technical director Art Thompson. After a few leaps, oneteam member described Baumgartner's performance as "perfect." "We still have an unknown, which is what happens to my body when Ibreak the speed of sound, but at least we're going to know that I'm able tohandle the step-off," Baumgartner said. Lastly, the pilot passed several high altitude test dives at 26,000 feetover the desert in Perris, California. Thanks to a new chest pack aligned toone side of his body, Baumgartner exhibited a harmonious passage compared toprevious trials a year earlier. The previous chest pack had jammed his helmet, blocked his vision andconstrained his movement during descent and the critical landing. During the recent tests, body positions and suit deflation went well enoughthat the team accomplished all of its objectives. No simple showman, Baumgartner wondered if the dangerous pioneering missionwould mean his own death. "My biggest concern is that dangerous part of the project which we justhaven't thought of," Baumgartner said in a statement. "We tryto think of every contingency, but there's always going to be something thatyou would never imagine could happen. And that might kill you." The possibility has proved daunting enough to impact his decision to invitehis own mother to watch the dive. "If everything is successful, I would love to have her on site, becausethe first person that I would want to talk with is my mom, of course," hesaid. "But if something goes wrong, I definitely don't want my mum onsite, because I don't want her to witness a fatality. So I still haven't madeup my mind." According to a press officer for Red Bull, the actual experiment will takeplace somewhere in North America in 2010. Along with a range of experts andtest pilots, mentor and former record-setter Joe Kittinger will also bepresent.